Quinoa is delicious on its own and the earthy flavor of quinoa makes it ideal for pilafs, soups and salads. Unlike many whole grains, quinoa takes very little time to prepare and can be substituted anywhere whole grains are used. It is a nutritious alternative to couscous and white rice in most recipes. It is a good source of iron and high-quality protein. 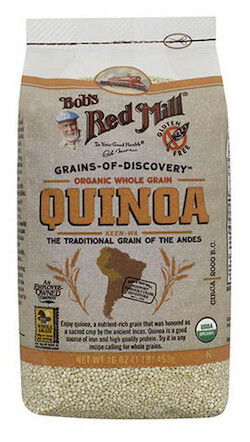 Whole grain quinoa has mild flavor and is well suited to pilafs, salads, soups and stir fries. Naturally gluten-free, this powerful little grain is a great addition to any diet and is an ideal solution for those following a gluten free, vegan or vegetarian diet that are looking to increase their protein and fiber.